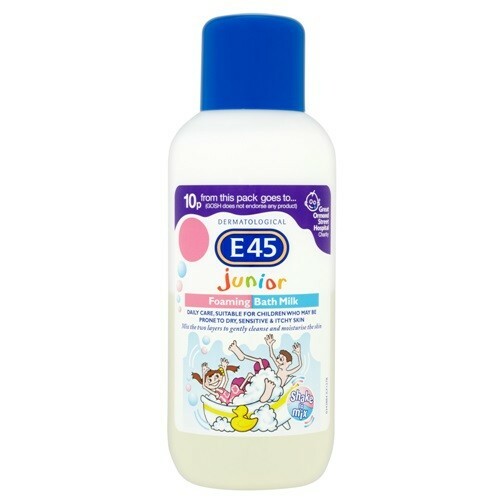 E45 Junior Foaming Bath Milk is a fun bubble bath which will help keep kids' skin clean and soft. E45 has combined its skincare expertise with the fun of a bubble bath to create a product that makes bathtime exciting for kids. This bubble bath is designed to get kids' skin really clean whilst providing gentle moisturisation to keep skin soft healthy and supple. The gentle formula contains no colours or soap is perfume free and dermatologically tested so it's safe to use even on young children. This hypoallergenic lotion is formulated not to cause allergic reactions and its non-greasy so it won't clog young pores. This bubble bath comes in two parts: a foamy cream wash and a soothing moisturising milk. Shake the bottle well and pour under running water for a fun bath.